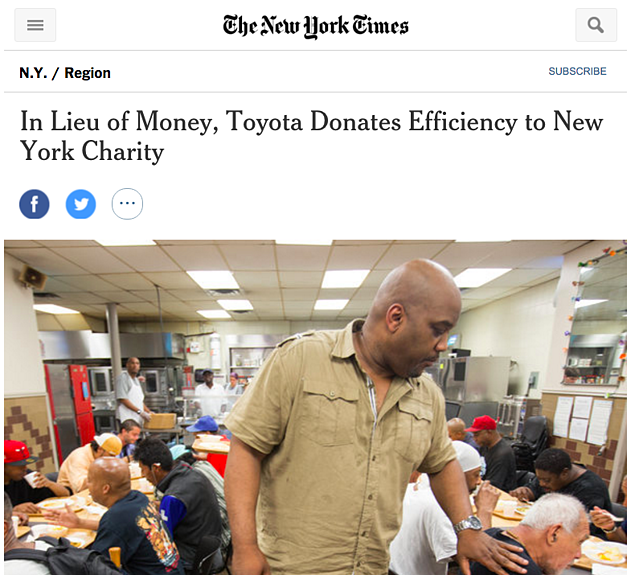 "In Lieu of Money, Toyota Donates Efficiency to New York Charity"
The article describes how Toyota, through its TSSC group, works with non-profits to "get Lean" through the philosophy and methods of the Toyota Production System. This all goes to show that Lean is not about "a better way to build cars." The Toyota style is not to come in as an expert, telling people what to do. Jamie Bonini, the head of TSSC, and their team engage others to improve their own work and processes. The power of Lean is helping others see their own work differently -- how to set goals, how to identify waste and opportunities for improvement, and how to see them through. Toyota also recently shared a set of videos called "The Toyota Effect," which I wrote about on LinkedIn. I've been blessed to learn a lot in my 20 years of "Practicing Lean." I've had great mentors and I've worked with great colleagues and client teams. I try to give back when I can. I've done some pro-bono work teaching Kaizen methods to Catholic Charities Fort Worth when they expressed an interest in making a goal of continuous improvement a reality. We haven't made videos or shared the story, but it feels great to make a difference behind the scenes. I'm helping people have a voice and a role in improving the way they deliver services to the community. It's not just Toyota... and it's not just me. I know many of you volunteer and share your Lean or continuous improvement experiences with others. If you have a story to share, please post a comment below. What have you done or what would you HOPE to do with a non-profit or a charity, given a chance?